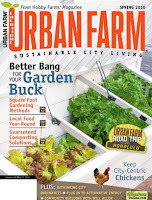 Our Mad City Chickens film was mentioned in this Spring edition of Urban Farm Magazine. The article focuses on several backyard chicken owners including the delightful Lynch family who made a home for two of the hens in our film--including Ricka (formerly known as T2--the Giant Chicken). It was the Fall of 2007. The production phase of the film was winding down but post work was only just beginning. We'd shot all the footage we needed of our two backyard hens, T2 and Red. We first got these two girls specifically for the film--to shoot much needed chicken footage. After that, the plan was to give the hens to some friends who agreed to adopt them. For all of the six months prior, each morning we'd let the girls out into the backyard during the day and would bring them into our garage at night. This seemed to work well for both parties. We became quite attached to the hens and were considering keeping them permanently. However the weather would soon begin to turn, and we'd have to make a decision. Either build a coop for the winter or send them to their new home. The hens were part of our "family" so we started making plans for the coop. But then work on the film just became all consuming. Editing, promotion, travel--we had less and less time to be with the girls. It was clear that we wouldn't be able to provide them with a comfortable coop and enough loving care. About this time, we heard about the Lynch family who were thinking about getting their first chickens. So the short of it is, our two hens ended up going to live with them. Read about it in Urban Farm Magazine (Spring 2010). Kind of ironic that you make a film about raising backyard chickens, yet weren't able to do it yourself and had to give them up. We'd had backyard chickens in the past, and we loved the experience. These two hens were ones that we got specifically for the film. So we actually had a home lined up for them before they even came to us. But after spending 6 months with them, we just didn't want to give them up. Sorry you couldn't keep your girls. But it is good they will have a nice warm hen house. Our pullets are laying from their toasty house with a heat light. Snow storms outside! Cute little brown and green eggs!